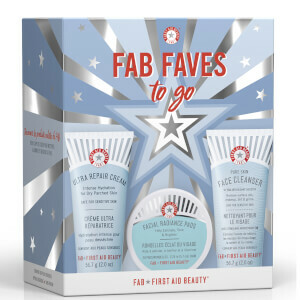 Bring back your skin’s glow with the First Aid Beauty Love Your FAB Skin Kit. The five-piece set contains products to cleanse, brighten, hydrate and transform skin for radiant and healthy-looking results. 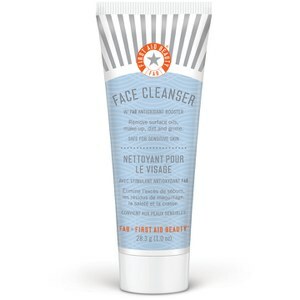 A gentle makeup remover with antioxidant benefits. The luxurious whipped formula transforms into a rich cream upon contact with water, sweeping away dirt, impurities and excess oil to refresh and brighten the complexion. Allantoin and Aloe work in harmony to soothe irritation and redness, while Glycerin replenishes vital moisture to maintain the skin’s natural balance. Combining powerful Lactic and Glycolic Acids, the pads work to improve skin's clarity whilst visibly reducing the look of pores and diminishing the appearance of fine lines for a brighter, smoother, younger looking complexion. A blend of Cucumber and Indian Gooseberry tones the skin, whilst Lemon Peel and Liquorice Root leave your complexion renewed, radiant and glowing. The quick-absorbing moisturiser feels velvety soft and is a luxurious treatment for your face after a long day or to start a new day afresh. Formulated with Colloidal Oatmeal, Shea Butter, Meadowfoam Seed Oil and Liquorice Root to help boost your skin's natural barrier function, keeping out grime and retaining natural moisture. Treat your lips to a moisturising formula that brings all the goodness of FAB Ultra Repair Cream and works to heal, nourish and hydrate dry and chapped pouts. Protective and soothing with Shea Butter and Glycerine, the petroleum-free balm also combats free radicals. Expect soft, nourished, smooth lips. 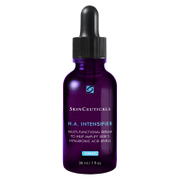 Formulated with an advanced blend of three Alpha and Beta Hydroxy Acids; Lactic, Salycic and Actizyme, which work in synergy to gently exfoliate the surface layer of skin and eliminate dead cells that cause dullness and dry patches. 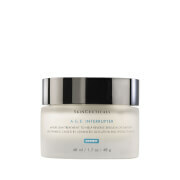 Extracts of Active Charcoal and Natural Kaolin Clay safely stimulate natural cell renewal in one simple step, resulting in smoother and plumper looking skin. Ultra Repair Lip Therapy: Apply liberally throughout the day, or as needed. Can be worn alone or with lip colour.